The late Mark Kram never intentionally desired to be spelled the same backward as forward. 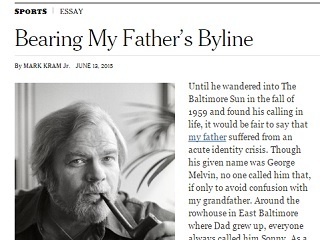 Last Sunday, Mark Kram Jr. shared a wonderful essay about his dad, the late sportswriter Mark Kram. Per the article title (“Bearing My Father’s Byline), the piece was mainly about being mistaken on the page for dad. In honor of SI’s recent 60th anniversary, the publication re-posted a Kram article about the third and final Ali-Frazier fight in Manila. You can read it here. P.S. Somewhat surprisingly, the 2002 NYT obit for Kram made no mention of his assumed name.